The lithophane lamp in the Music Room is a hidden gem of tours at the Gibson House. In fact, while opening up the museum for the day and turning on all the lights in the house, I make it a point to leave this particular lamp off. This, of course, can sometimes lead to visitors being puzzled as to why I have gathered them in one corner of the Music Room to look at a small, seemingly simple lamp. However, the theatrics of pulling the metal chain with a dramatic flourish and waiting for the visitors to express their surprise continues to be one of my favorite parts of giving tours. According to the Blair Museum of Lithophanes, lithophane is a Greek word that combines litho, meaning stone, and phainen, meaning to cause to appear. However, despite its deceptive name, lithophane is actually made of etched porcelain that is usually backlit either by natural sunlight or electricity. The first lithophanes were made in European factories in the 1820s by modeling a waxen image on a backlit glass panel. Craftsmen molded and etched the lithophanes so that they would appear translucent in the light; indeed, the thinner the porcelain, the more brightly light could shine through. This attention to detail is, in fact, part of what makes images illustrated in lithophane come to life in a way that no other artistic medium can imitate. They are unlike scenes you would see in stained glass, for example, because they are completely three-dimensional and depict images in off-white and gray tones as opposed to full color. The lithophane lamp in the Music Room features six engraved porcelain panels, a rope column, and a square marble base. Although we are unaware of the exact date when the lamp was made, it is, according to our records, an original family piece. The lamp was originally gas operated and later altered to accommodate electricity. One of the panels depicts what we believe is Saint Hedwig, the patron saint of Silesia, a region in Poland. She was canonized by the Catholic Church in 1267 and was known for her joint effort with her husband, Henry I of Silesia, to found several monasteries across Europe. The lamp’s other panels illustrate scenes featuring a girl and three dogs, two lovers, a wistful woman next to a cage filled with birds, a young boy and old man entering a river, and a man who seems to be teasing a sleeping maiden with a feather. Rosamond Warren Gibson may have used the lithophane lamp to create stories for her children. Rotating the piece to transition from one panel to another, she could introduce them to new worlds and narratives. Little did she know, the lamp would continue to enchant visitors young and old to the Gibson House for many years to come. Blair Museum of Lithophanes. “What Is a Lithophane?” http://www.lithophanemuseum.org/lithophanes.html. Accessed 3 August 2017. Carney, Margaret. “Lithophanes ... Not a Dead Art Form.” Ceramics Art and Perception, no. 87 Mar. 2012. Kirsch, Johann Peter. “St. Hedwig.” The Catholic Encyclopedia. Vol. 7. New York: Robert Appleton Company, 1910. http://www.newadvent.org/cathen/07189a.htm. Accessed 3 August 2017. 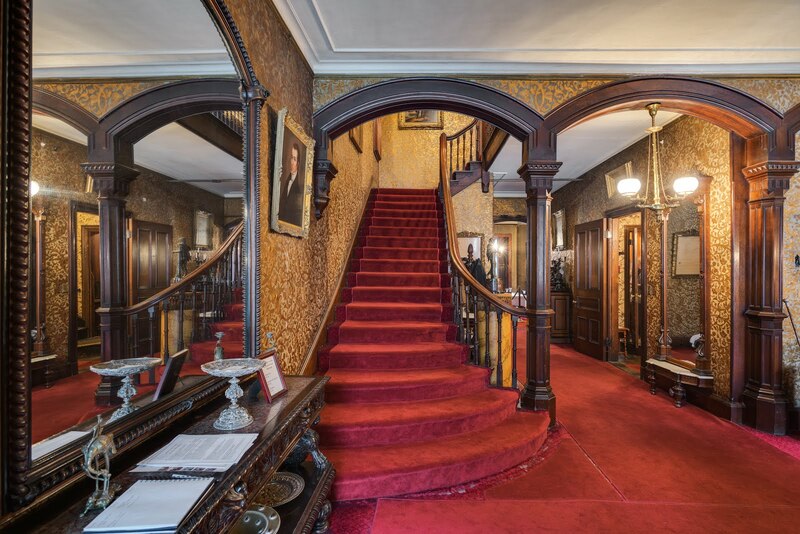 Part of why the Gibson House Museum serves as such an integral part of Boston’s historical landscape is its ability to capture, under one roof, the shifts in decorative and sociopolitical trends in the nineteenth and twentieth centuries. Upon visiting the museum, you will likely notice a distinct change in decorative moods depending on which room you are in. The entrance hall, for example, is primarily decorated in the 1860s Renaissance Revival style that would have been popular in Gibson matriarch Catherine Hammond Gibson’s time. The console table and matching mirror to your left as you walk into the museum are both carved in ebonized black walnut, which would have been an expensive and highly desirable material. Placed in the first room the Gibsons’ guests would see, this Renaissance Revival furniture would have showcased the family’s knowledge of, and appreciation for, an older, revered age of artistic innovation and achievement. 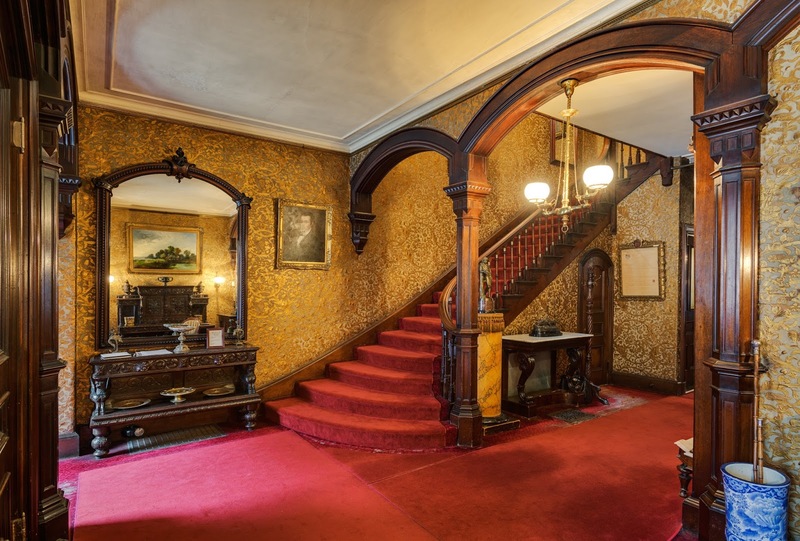 After Catherine Gibson’s death in 1888, her son Charles and his wife Rosamond Warren Gibson began to redecorate and modernize parts of the house, including the entrance hall. The beautiful Japanese “leather” wallpaper, one of the highlights of the house, was Rosamond’s choice and serves as a rather bright contrast to the room’s darker, more authoritative palette. The wallpaper, gilded and embossed with gold flowers and fruits, adds an airier feel to the entrance hall that resists the severity of Catherine’s Renaissance Revival style. The Aesthetic Movement that appeared in America during the 1870s heavily influenced this design choice and others like it in the house. It rose to popularity under the motto “Art for art’s sake” and called into question the notion that art had to convey a concrete sociopolitical message. Instead, Aestheticism, as its name might suggest, placed value on the craftsmanship and detail of decorative art. It prided itself on delicacy, prioritizing lighter colors and fabrics over the heavier and darker Victorian materials. The 1876 Centennial International Exhibition, held in Philadelphia, was absolutely integral to the rise of the Aesthetic Movement. It hosted manufacturers and dealers from thirty-eight nations and was the first world fair of its kind to be hosted in the United States. While the exhibition succeeded in showcasing America’s growing industrial and economic might, it also introduced the country as being a hub for artistic innovation and creativity. The sheer number of the exhibition’s East-Asian manufacturers combined with the recent opening of trade between Japan and the western world in 1854 also triggered a sort of obsession for Japanese ceramics, prints, and designs. At the Gibson House, this design interest is reflected in both the dining room and the music room. The Centennial Exhibition and the Aesthetic Movement it fostered were nothing short of revolutionary in that they allowed the general public, including families like the Gibsons, to invest in a type of cross-cultural exchange, as well as to blur the line between domestic and artistic space. “The 1876 Centennial Exhibition.” Beinecke Rare Book & Manuscript Library, Yale University, 1997. http://brbl-archive.library.yale.edu/exhibitions/orient/centen.htm. Accessed 19 July 2017. Burke, Doreen Bolger. In Pursuit of Beauty: Americans and the Aesthetic Movement. New York: Rizzoli, 1987. MacCarthy, Fiona. “The Aesthetic Movement.” The Guardian, 25 Mar. 2011. https://www.theguardian.com/artanddesign/2011/mar/26/aestheticism-exhibition-victoria-albert-museum. Accessed 19 July 2017. Wolf, Stephanie Grauman. “Centennial Exhibition (1876).” Encyclopedia of Greater Philadelphia, Rutgers University, 2013, philadelphiaencyclopedia.org/archive/centennial/. Accessed 28 July 2017.